Welcome back to Part 29 of The Accidental Remodel! The LAST project in the remodel was because of all the issues with my hands and wrists. I have only been able to use the top plate in the stack for years. I have some pretty dishes and want to use them, or what's the point of having them? With the new cabinets, I wanted to stand them on end and that way I could snag any plate I want! I tried just standing them on end, but I had to hold back lots of heavy plates with one hand in order to extract the plate I wanted and then all the plates to the right wanted to come too and roll out of the cabinet. 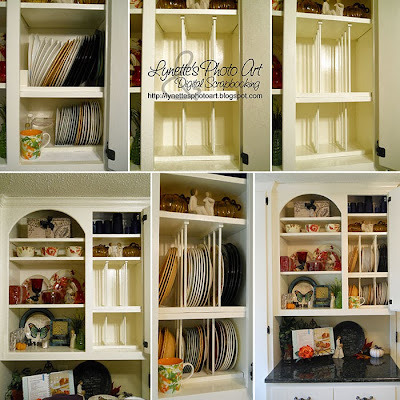 It was being harder on my hands than a stack, so...I started brainstorming ways to divide the cabinets into thirds! The cheapest way I could figure to do it was with a narrow strip of wood and dowels. I checked my plan out with a man at Lowe's and he said it would work just fine. I drilled matching holes the diameter of my dowels in all the strips and screwed them to the shelf above and below in each opening. Then I cut dowels to the height I needed to accommodate salad plates and rim soups in one opening and dinner plates in the other. I stuck the dowels into the bottom strip's holes and then, since the shelves are adjustable, I was able to just lower the upper shelf and guide the dowels into the upper holes. I chose to make the dividers for my salad plates only as deep as needed and that left space in front to put other things. The solution to plates rolling out the front opening accidentally was 1" square strips I cut to the width of the opening to prevent any escapes. They are working fine without even attaching them. They are snug and the front of the cabinets hold them in. Then I painted everything to match the cabinets. When I had gotten a professional's estimate, it was hundreds of dollars for plate racks. In fairness, his way was different than mine, but would have lost valuable space too. How much did this cost us? The screws had been my father's and I reused dowels I'd saved from a broken clothes drying rack. Don't you just love to re-purose things that would over wise end up in a landfill? I sure do! I bought one strip of wood and three dowels and paid a whopping $8.02 at Lowe's to do both cabinets. So, all in all, a very affordable and effective solution and isn't it beautiful? And I love that it's easily reversible if anyone ever wanted to change it back. It's working like a dream! So, after this sneak peek, are you ready for the big reveal? You won't believe the before and afters! Be sure to come back for the final post in The Accidental Remodel on Monday the 14th! I'm still taking pictures and getting the post ready, so be patient just a wee bit longer! Big hugs and have a great day!